I must be getting excited about my upcoming trip to Kauai because all I can think about is The Garden Isle! Besides all the wide-open spaces and amazing vistas, I can’t wait to hike to some of the island’s most incredible waterfalls. 1. Waipoo Falls: Our family plans to make a day of Waimea Canyon, which means we can get a great view of Waipoo Falls. It’s a glorious 800-foot waterfall in Waimea Canyon that you can see the falls from various lookout points along Highway 550, the road that takes you up to the museum and park. We might even try the Waipoo Falls Trail Hike, a 3.2-mile roundtrip hike, which is located just off the highway between mile markers 14 and 15. While we won’t see the falls up close in their splendor, the hike will take us through rain forests and canyon rims ending at the top of the waterfall in a Awaawapuhi Ginger lined stream. Bonus: Hawaii Jeep Tours just started a Kauai Jeep Tour which features this hike to Waipoo Falls. Bruce–can we go!? 2. Hanakapiai Falls: According to poipubeach.org, you can find this waterfall after driving to the end of the road on Highway 56 and parking in the lot fronting Kee Beach. Then, you can head out on the 2-mile Hanakapiai Trail. This is a very popular trek on the island so they suggest going early in the morning. For the first 2 miles you will be rewarded with spectacular views of the Na Pali Coast as you traverse on switchbacks along the coastline. Once you arrive at Hanakapiai Beach, it is an additional 2 miles upstream to the falls. The trail can be rough in spots, but the 300+ foot waterfall at the end of the tramp is definitely worth the adventure. This experience is NOT recommended for small children due to the terrain and difficulty of the hike. When you hike Waimea Valley on Kauai, you can expect to see a beautiful waterfall from the road that takes you up to the museum and park. 3. Wailua Falls: Since well be staying in Poipu, not far from Lihue, you can be sure we’ll make a trek to Wailua Falls. It’s a double-tiered waterfall, located just north of Lihue, and it’s the most easily accessible on Kauai. You may recognize the prestige of these falls as they were used in the opening credits of the 80’s hit show, Fantasy Island. This adventure is definitely recommended for families with small children as there is no hiking involved. The views are just a short walk from the parking lot. 4. Secret Falls: Poipubeach.org says the waterfall is actually named Uluwehi Falls, but locals call it Secret Falls. It’s located on the East Side of Kauai and requires water transport to get to the falls’ trailhead, located up the Wailua River. You can travel via kayak or canoe, and there are several companies in the area that you can rent from. Or you can always book a guided adventure. Once you land your boat at the entrance to the trailhead, you hike up to the falls on a trail that can be extremely muddy and slippery. Hiking boots are not recommended. The website authors suggest either going barefoot, using sport sandals or tabis. If you travel at a relaxed pace, it takes about 45 minutes each way. The is a great family friendly adventure for children that don’t mind paddling up the river and getting a little dirty on the trail. A hike to Waipoo Falls is included with your Kauai Jeep Tour, the newest tour at Hawaii Jeep Tours. 5. Opaekaa Falls: Like Wailua Falls, this majestic site is easily accessible and requires no hiking. Poipubeach.org advises you simply turn up Kuamoo Road (580) from highway 56 and travel up the hill to the lookout that is located adjacent to the parking lot on the right hand side. Families with children all ages would enjoy Opaekaa Falls as the views can be seen from a brief walk from the parking area. Kauai is called The Garden Isle for a reason — it’s the epitome of lush and verdant island scenery. 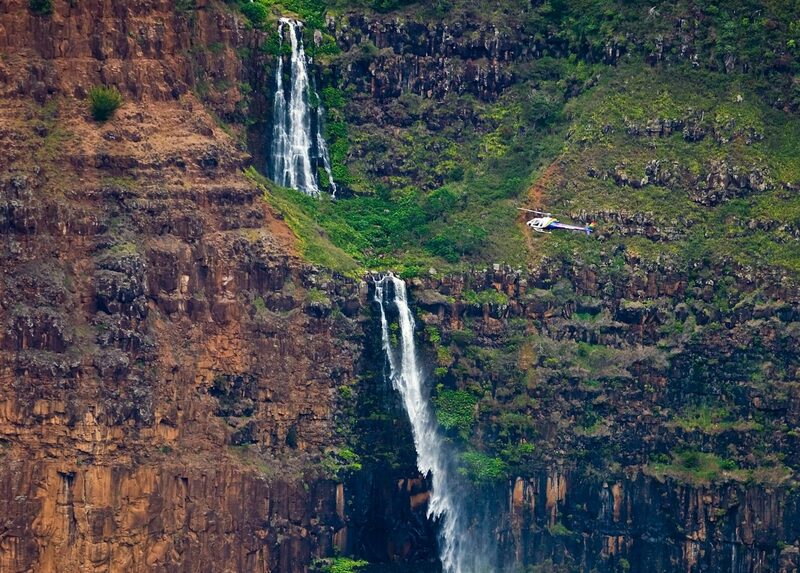 And, waterfalls are an important part of any Kauai adventure. This list certainly has me inspired to visit at least one of these top 5 waterfalls on Kauai — your turn next!